Basilar Records brings you Split EP. A 2-sided, 8 track limited edition vinyl release featuring the works of both Diarmo and Banku. Bringing forward 4 tracks on each side, Split EP is an eclectic mix of what Basilar Records and these respective artists do best, championing 4-to-the-floor electronic music, with lashings of layered, complex ambient beats for your listening pleasure. A long wait for a long-awaited title, whether you are new to Basilar or interested in something new, Split EP is one release you deserve to have. Complimented with individually screenprinted cover art on the front and back, designed and printed by visual artist L'Aubaine (Laurie Bender), this limited edition Vinyl will delight visually and aurally. Diarmo, the solo project of Diarmuid Slattery, a London based Dj/Producer and musician creating a crossover style of melodic electronica. With this his forth release on Basilar Records, he always continues to shape his sound, adding that melodic touch to his style of Ambient, Techno and House. London based independent label Basilar Records was founded by Diarmo in 2011. 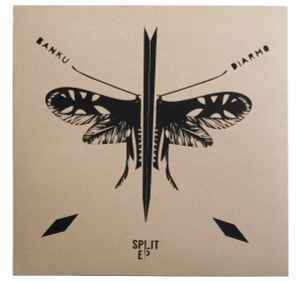 Banku is the project from London based electronic music producer and visual artist Claudio Crispo. His style is a coherent mix of House, Techno and Bass. Banku absorbs everyday surroundings and combines it with addictive grooves to create this unique, energising sound. Claudio has two previous releases on Basilar Records with his Bring to Mind and Mind the Beat EPs. Available on Vinyl (Limited-Edition, 12" Vinyl 100 prints + screenprinted cover art) plus high-quality download in MP3, FLAC and more.